These chewy, kid-friendly bars are the ideal grab and go treat to have on hand a sudden snack attack hits. Store-bought bars can be loaded with refined sugars, preservatives, and other less-than-healthy ingredients. These little beauties are tart and savory, thanks to the addition of cranberries, walnuts, and cinnamon. 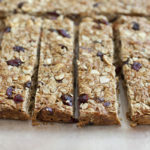 Enjoy these cranberry granola bars featuring raw honey with tart cranberry, crunchy walnuts, and ground cinnamon. Combine granola, oats, flour, and cinnamon in a large bowl; mix well. Set aside. Combine egg, applesauce, and honey in a medium bowl; mix well. Add oat mixture to egg mixture; mix until just blended. Spread mixture into 8 x 8-inch baking pan. Bake for 20 to 22 minutes, or until firm.